In working on a business intelligence project a common situation you will find yourself in is having to come up with a cumulative value (running value) calculation. The challenge that you will find is that depending on what product you are working with the calculation that you need is going to be different. 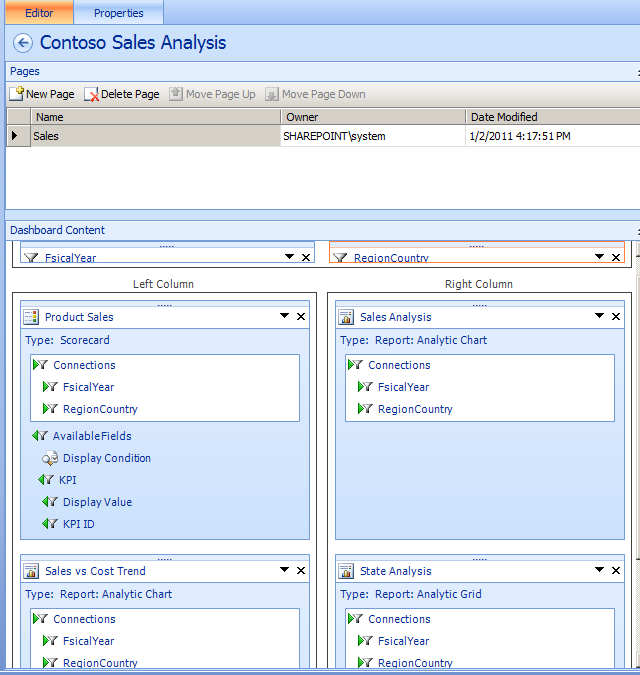 In this post I will compare how this can be done with T-SQL, Excel, SSIS, SSRS, MDX, and DAX. Along the way I will provide some additional reference links to other options, content, and I will point out some differences in how the totals are being calculated so you will know what to expect with the results. 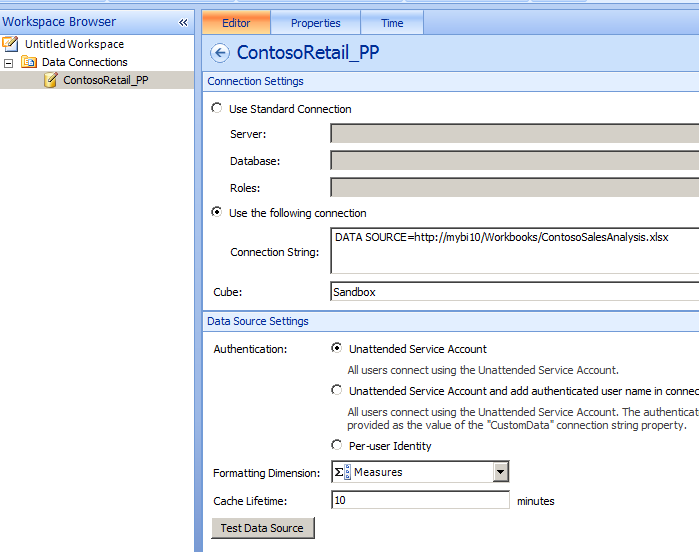 In these examples I will be working with the Contoso Retail Data Warehouse data sample. These examples below are not necessarily going to be the optimal approaches, just showing how you can go about getting at the desired result. 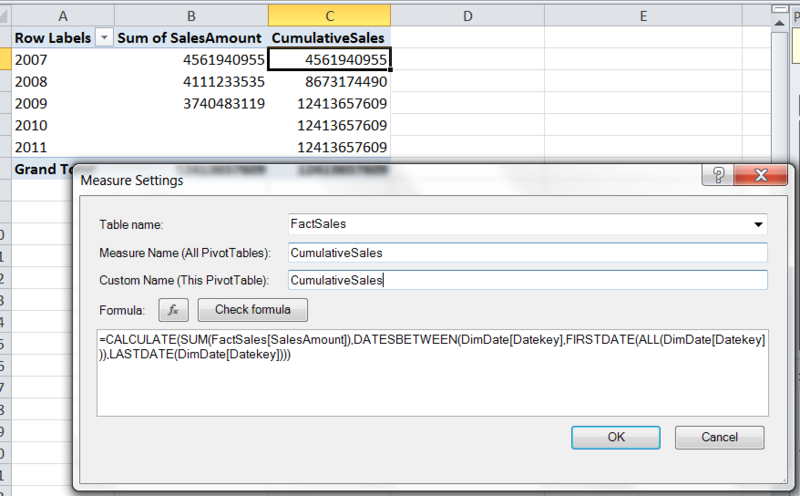 So let’s start out taking a quick look how calculating the sales over each of the years directly against the data in the database through SQL Server Management Studio. Not too bad. We have an inner query that is being used to return the pervious year(s) values and append that onto the current year (if they exist). If no value is returned then a zero is used in its place. 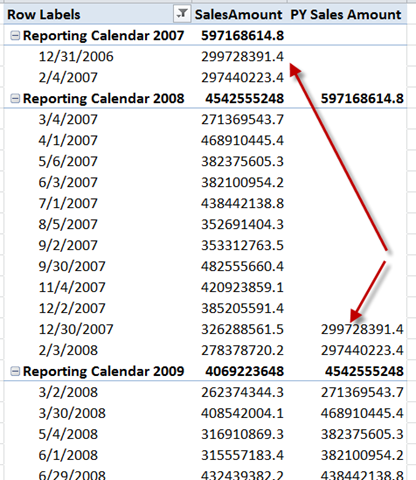 For additional examples and options take a look at this posting by Garth Wells – Calculating Running Totals. So now lets take a look at how this would be done if we were using Excel. There area a few different options you have here, in this example I enter a formula in the C2 cell of =SUM($B$2:B2) and then copy that formula down into cells C3 and C4. 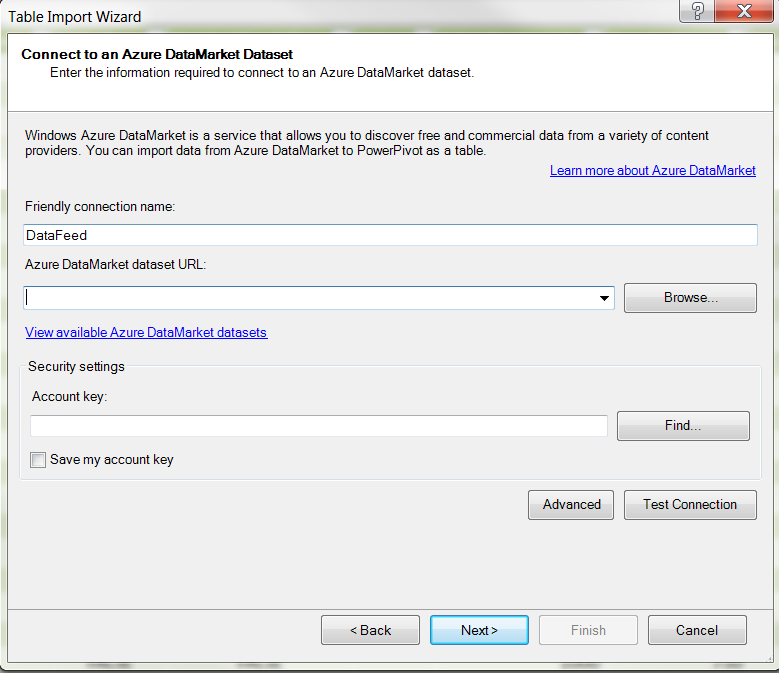 Now we will take a quick look at how this could be done in the ETL process. As we are pulling data from a source we can evaluate the values in the data flow and accumulate the values inside a script component. In the source we will simply get the sales for each year and then append the values in the flow to each other to get at the same results displayed above. 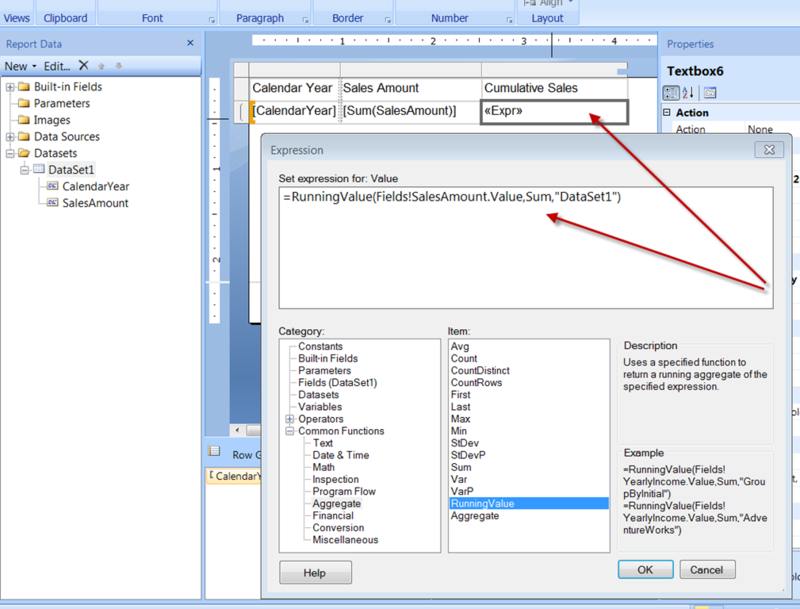 The cumulative value is being performed in the script component with some code. We have a variable setup that we are using to append the sales amount of each row in the data flow and then sending this value back out in a new output column called CumulativeSales. Nothing too fancy going on here. 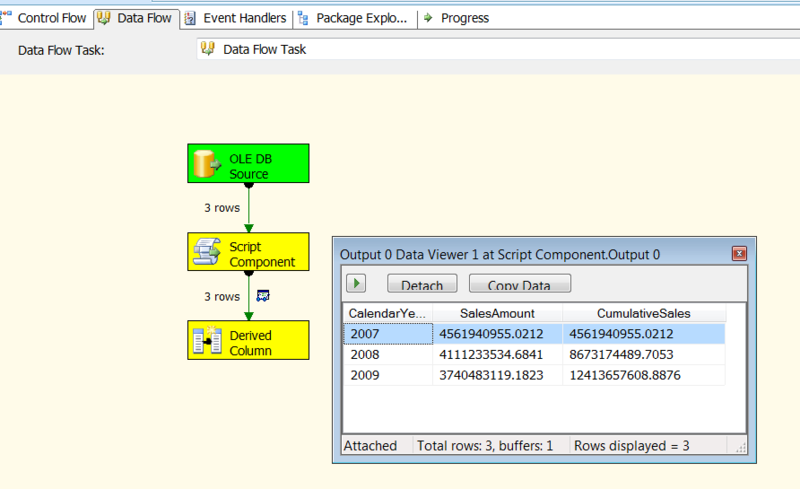 I don’t have a destination in the flow, just added a derived column to get the data viewer included so that I could run the data flow to show the results. Now lets switch over to Reporting Services. 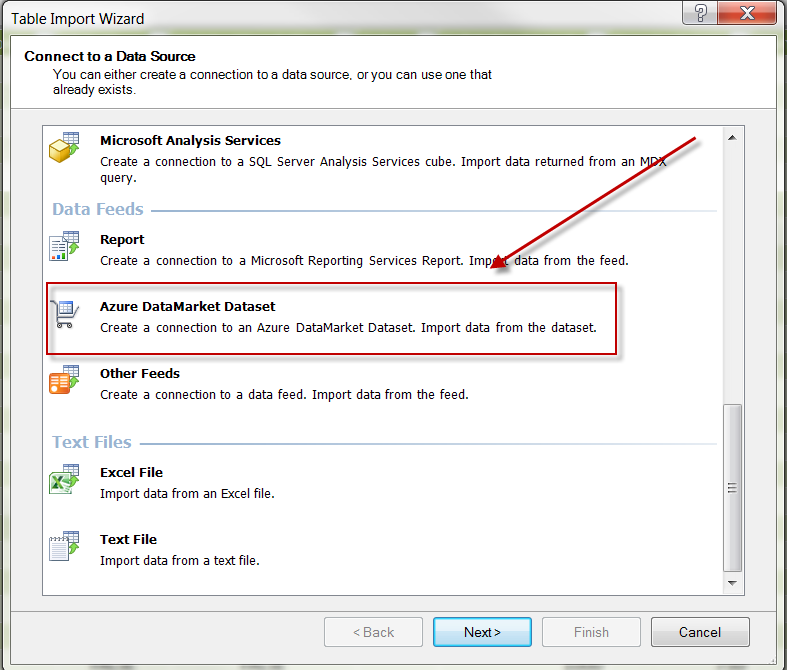 In this example we will not do the cumulative value in the dataset query, we will do this value calculation in the report. 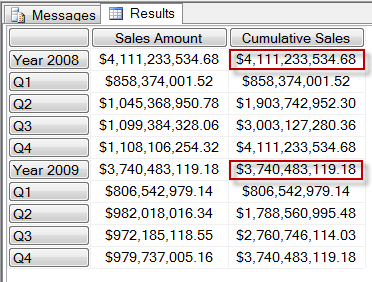 In this example we leverage the RunningValue aggregate function that is available in Reporting Services. 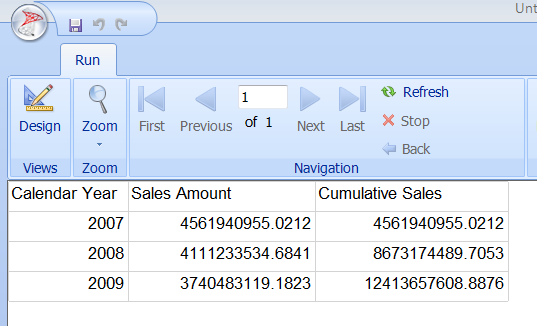 The expression that we use in the Cumulative Sales column is =RunningValue(Fields!SalesAmount.Value,Sum,”DataSet1″). This function returns a running aggregate of the values in our specified dataset using the SUM function which is also specified in the expression. 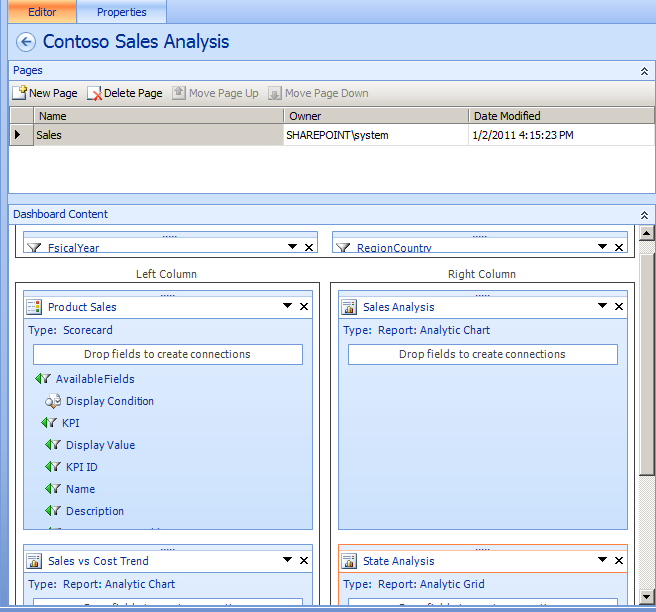 Now how about taking a look at Analysis Services. How would we go about doing this calculation using MDX? 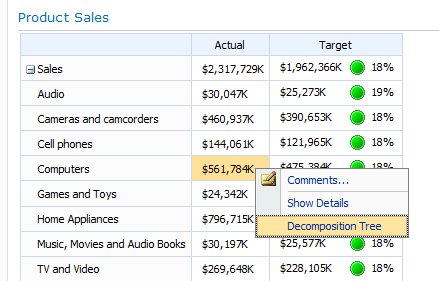 We can apply some filters into the MDX statement to remove the years that currently don’t have Sales Amount associated with them. There are additional ways in going about this calculation and for more options take a look at this recent posting here by Amish Manubhai Shah – Various way to calculate running total from All Period to Currentmember. Now I want to show how this solution differs a bit from the other ones we have seen. 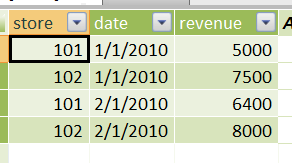 What happens if I apply a filter to the query to only display 2008 and 2009? What would you expect? Might not be what you would want, but then again maybe it is. The Cumulative Sales calculation is summing up the values from the beginning of time (the [All] level). So the first value that we see in 2008 is including the Sales Amount from 2007 as well (if there was sales in 2006 it would include that as well and so on). You can make a few modifications to the calculation and setup a named set to reference the items and come up with something along these lines. 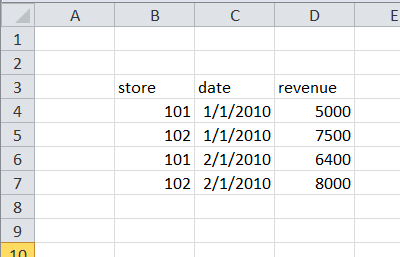 Here a dynamic set is used to get the references of the members that are in the slicer (WHERE clause) and feed this information into the calculation for the cumulative sales to grab the first item to come up with the reference to the 2008 year. This will be the starting point for the cumulative total instead of from the beginning of time. Here we can see that our cumulative total stops at the year level and we can see at the lower levels that the values are accumulating as expected, so the cumulative total at Q4 is same as the Yearly value. What we have now is a YTD calculation. 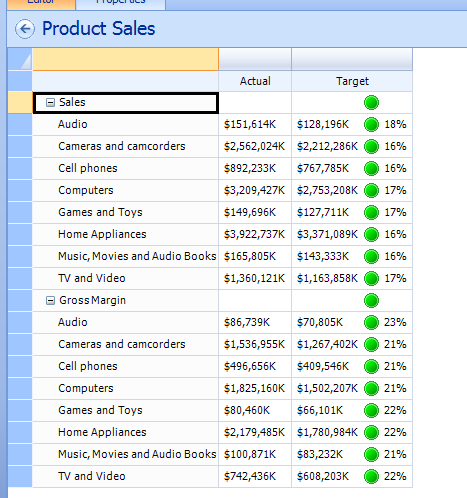 We have one more product that I want to take a look at and that would be PowerPivot. This is going to be fairly similar to the Analysis Services solution since it actually is Analysis Services behind the scenes, the only difference here is that we will be using DAX instead of MDX. You could go ahead and add some additional logic to evaluate the Sales Amount to determine if a value exists, but you get the general idea here. Once again this is calculating the cumulative total from the beginning of all time and that is done by using the ALL reference in the calculation for the FIRSTDATE. If we filter the years and only display 2008 and 2009 we will see the similar results like we did with MDX where the cumulative sales amount for 2008 includes the 2007 sales. 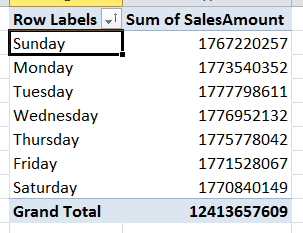 The one nice thing about PowerPivot is that this is in Excel, so if you want to do anything a little more custom or make any references to cells you can do that and use Excel functions as well. 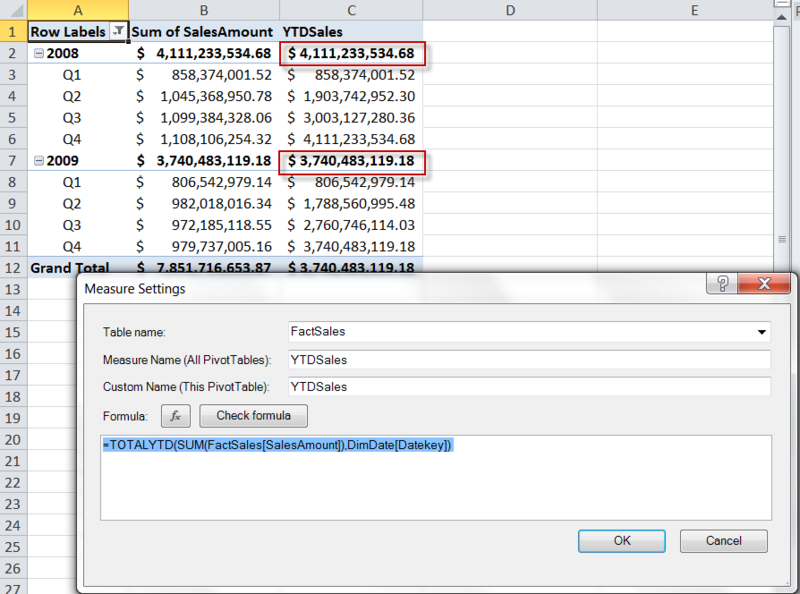 As far as setting up a cumulative sales amount value like the second MDX example I can’t determine an equivalent in DAX. 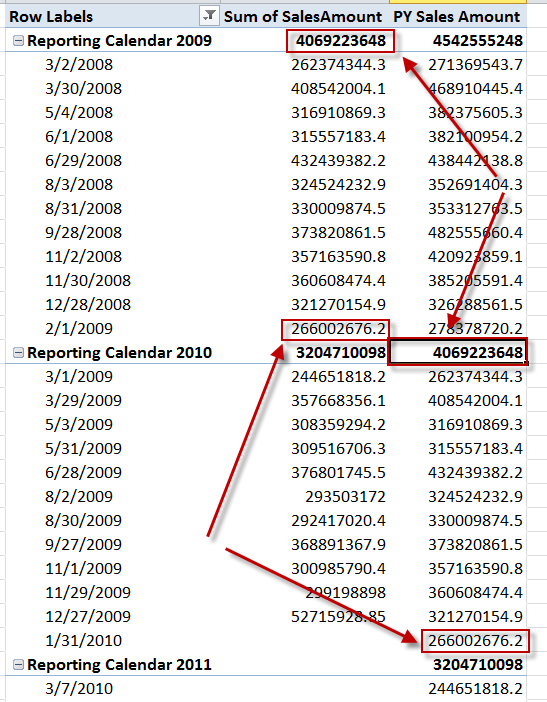 Maybe someone else has an idea if this can be done so that it only does this based on the Date values being evaluated. If you do, please leave a comment. Once again we can see that the yearly total is equivalent to the Q4 for the same year. 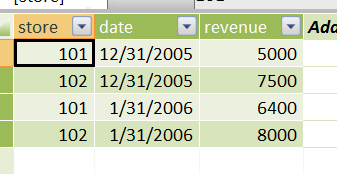 For some additional information and explanation of the PowerPivot calculations take a look at a great post by Kasper de Jonge here Accumulate values (running value) over multiple years in PowerPivot using DAX. Very simple and easy to understand, but that is just my personal opinion. UPDATE (6/20/2011): Modified table layout of step-by-step walkthrough to be two columns instead of three. Added a downloaded PDF file as well. 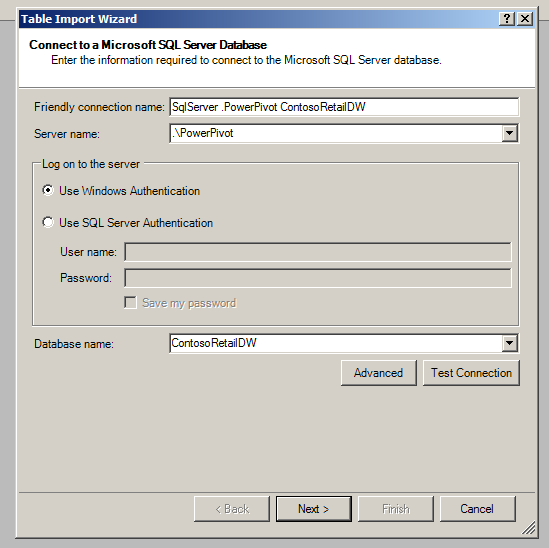 UPDATE (2/24/2012): I have a blog for using PowerPivot 2012 with PerformancePoint Servers here – Using PerformancePoint Services (PPS) with PowerPivot SQL Server 2012 RC0. Analysis Services was one of the primary data sources with the previous version of PerformancePoint to get the most functionality out of the product. 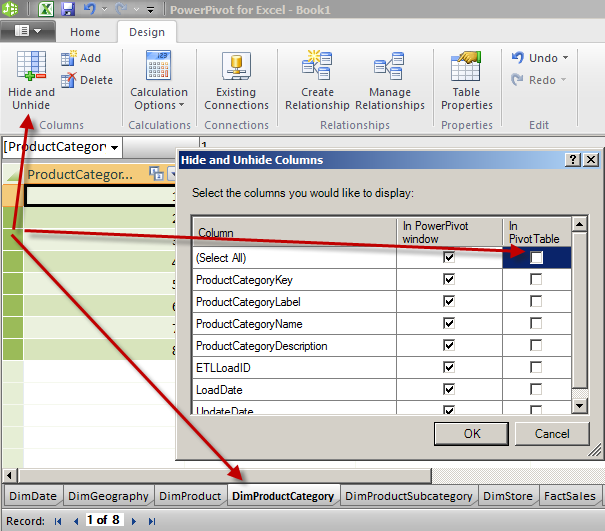 Now with the release of the 2010 product we have some new options and one of them is PowerPivot. 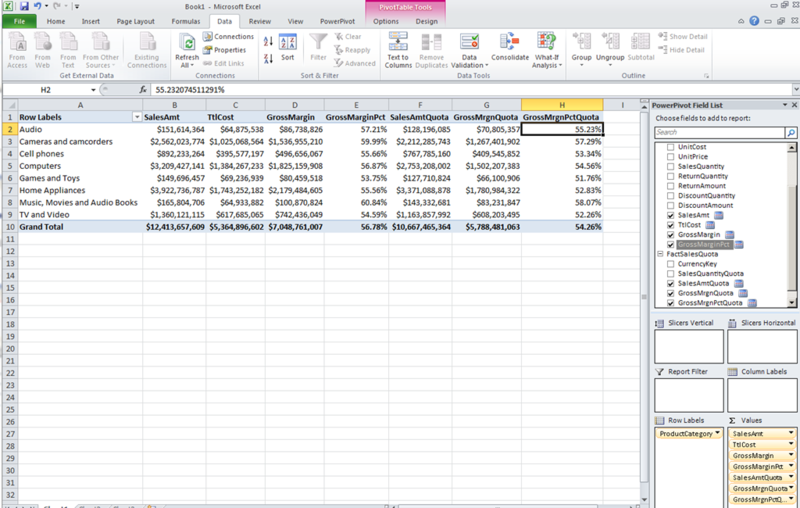 PowerPivot is also a multi-dimensional data source and in this post I will talk about what this source provides for functionality and what it does not compared to Analysis Services. First of all you will need to have an environment that has PerformancePoint Services configured. 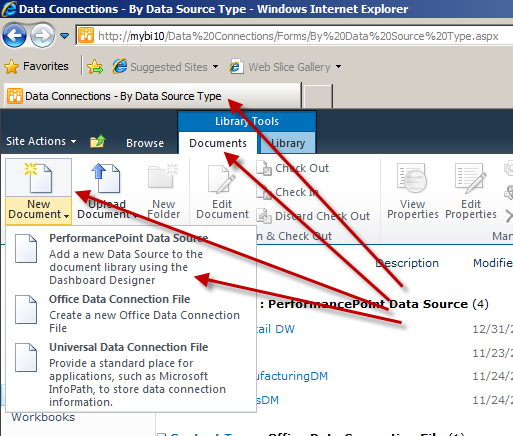 If you are not familiar with how to do that you can take a look at this great posting on the product team’s web site – Deploying PerformancePoint 2010 Soup to Nuts. Once you have that setup then the other thing that you are going to need to do is have PowerPivot setup with SharePoint so that we will be able to utilize the files as data sources. 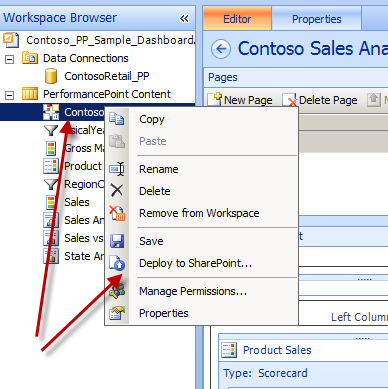 There are plenty of articles and material available in regards to this configuration, here is one of them – How to: Install PowerPivot for SharePoint on a New SharePoint Server. Once you have your environment setup and ready the next thing will need to do is create your PowerPivot data source that you are going to leverage to create your dashboard with. In this example we are not going to be creating the file and leveraging the PowerPivot PivotCharts and PivotTables, we are simply going to be setting up a file that will be used to provide the data and measures needed for analysis. 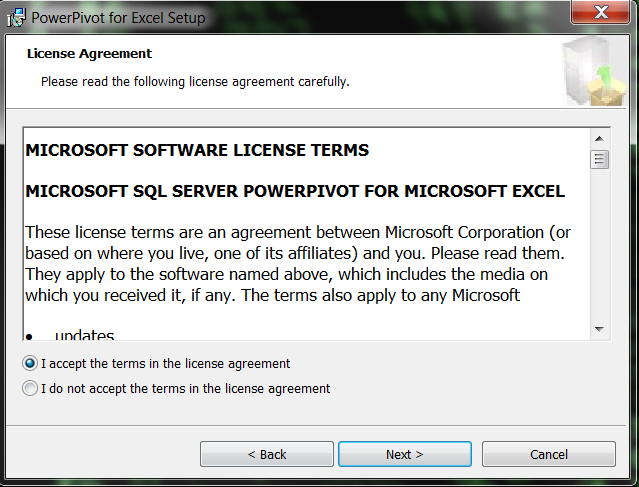 I will be using it in place of having to implement an Analysis Services solution (except for the fact that PowerPivot is really an Analysis Services database under the hood). 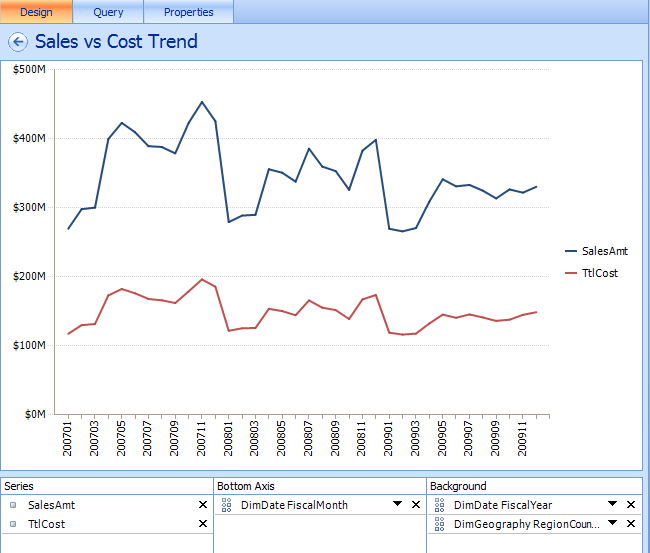 For this example I will be leveraging the Contoso Retail BI Demo data – Microsoft Contoso BI Demo Dataset for Retail Industry. I will also be using the following components to put this example together – Excel 2010 with PowerPivot add-in (this can be downloaded from here – PowerPivot Download), PowerPivot for SharePoint 2010, PerformancePoint Services, and SharePoint 2010 Enterprise. Warning: This example does not include each step-by-step instruction and expects that you have some basic knowledge of PowerPivot, DAX, and PerformancePoint. 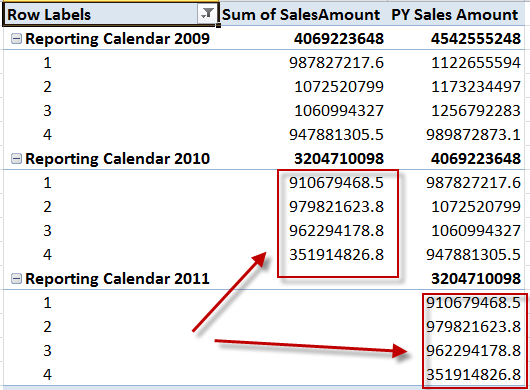 A couple of items that I wanted to discuss briefly about in regards to this example was the reasoning for setting up measures in the PowerPivot PivotTable and the other was for setting up the KPIs Calculation as Data Value. 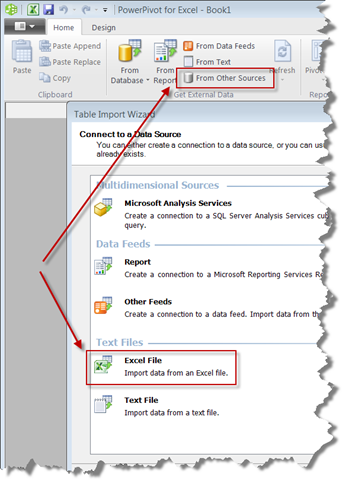 External tools require that you setup measures in the PowerPivot file in our to reference. 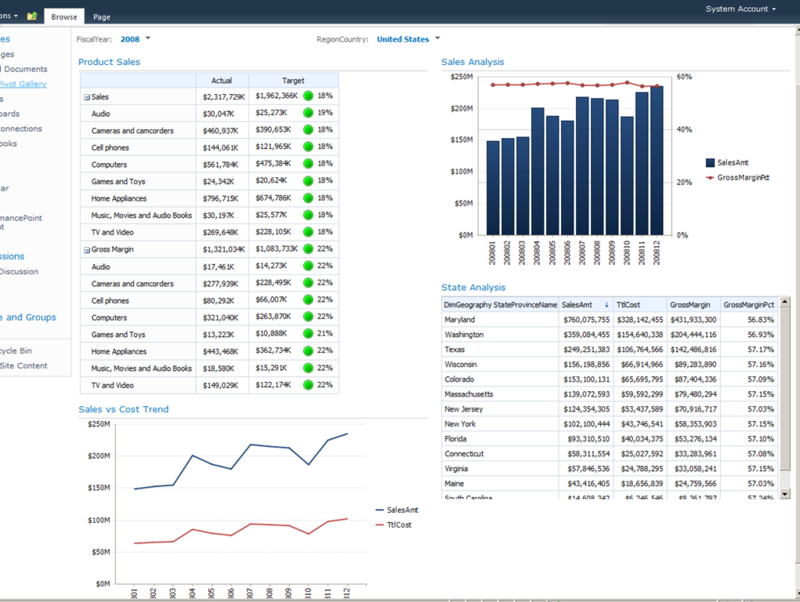 Whether you did this in PerformancePoint or Reporting Services, you would need to have measures defined to be able to reference to utilize for analysis. 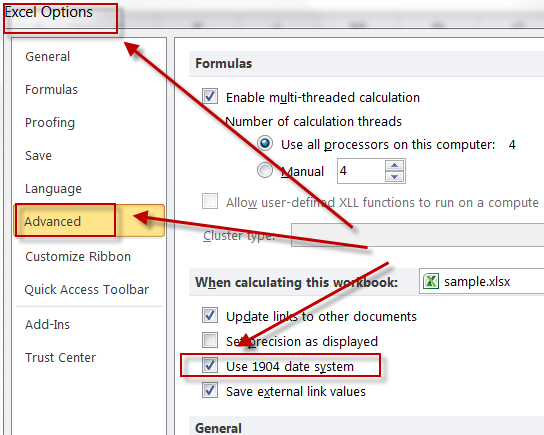 PowerPivot doesn’t have the ability to setup formatting either to pass through, so you also have to perform this in the tools referencing it currently. You can reference items placed in the PivotTables in the Values section, but you can’t guarantee these will always exist, so I recommend setting up measures for every metric that you want to evaluate and utilize with external tools. 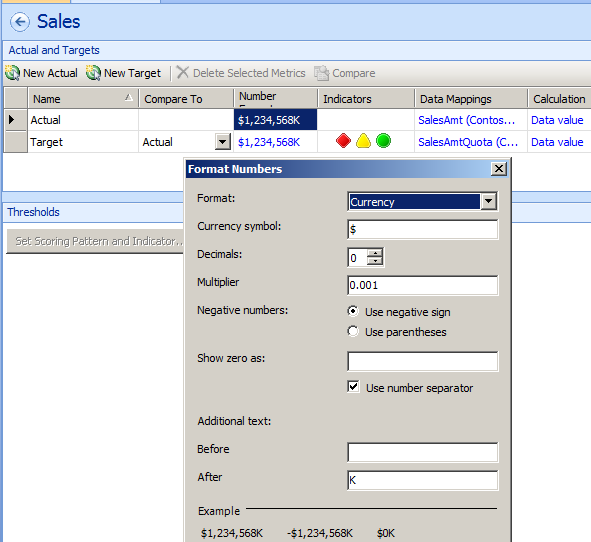 The other items that I wanted to mention was the KPI calculation setting. 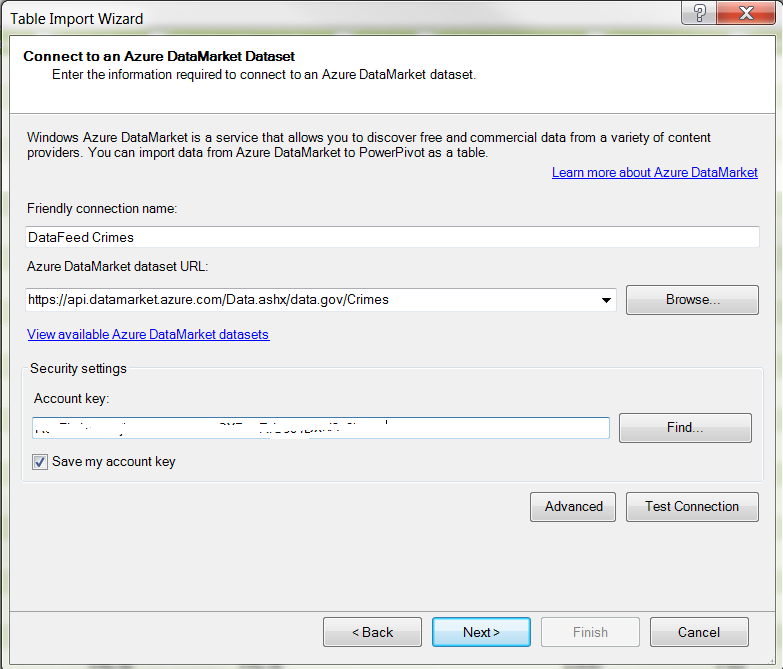 This was changed to Data value so that we would be able to leverage the Decomposition tree option in the right-click context menu. If this was left as Default value this would have been disabled. 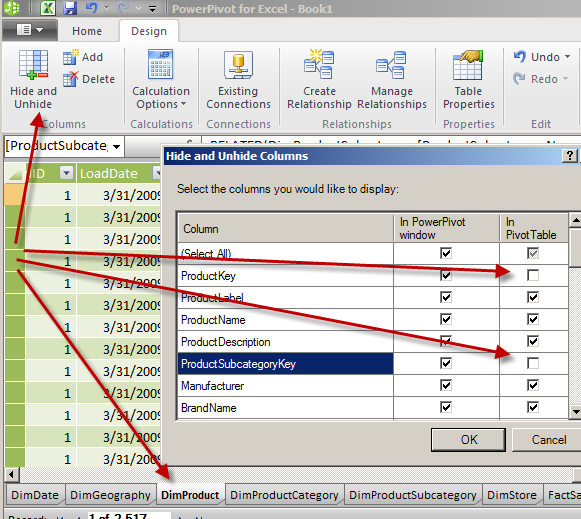 You currently cannot use the Show Details option since drillthrough is not an option in the current PowerPivot release, but you can use the Decomposition tree for analysis. 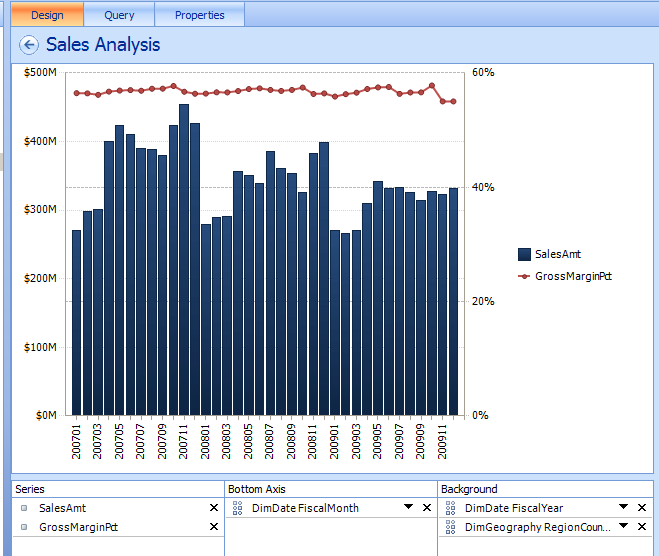 For the most part PowerPivot provides very similar functionality when compared to Analysis Services. A few items that you don’t get will be Show Details (Drillthrough), Named Set references, measure formatting (along with formatting configurations – colors), and user-defined hierarchies. For a good reference point for this type of a setup take a look at this white paper – PerformancePoint Services and PowerPivot for Excel (white paper). This white paper covers the basics of integration between PerformancePoint Services in Microsoft SharePoint Server 2010 and Microsoft SQL Server 2008 R2 PowerPivot for Microsoft Excel 2010. It describes the basics of utilizing a PowerPivot model in PerformancePoint Services and expands on issues and scope of using these applications together. Well that was a really brief and fast example of using PowerPivot with PerformancePoint, but you can see how quickly you can build out a fairly advanced dashboard that provides insight and analytical functionality to the end-users. 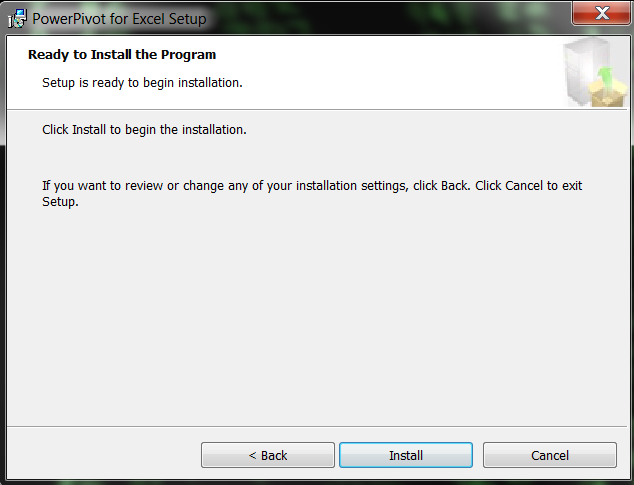 Pretty neat, no need to uninstall and reinstall – thanks Microsoft! 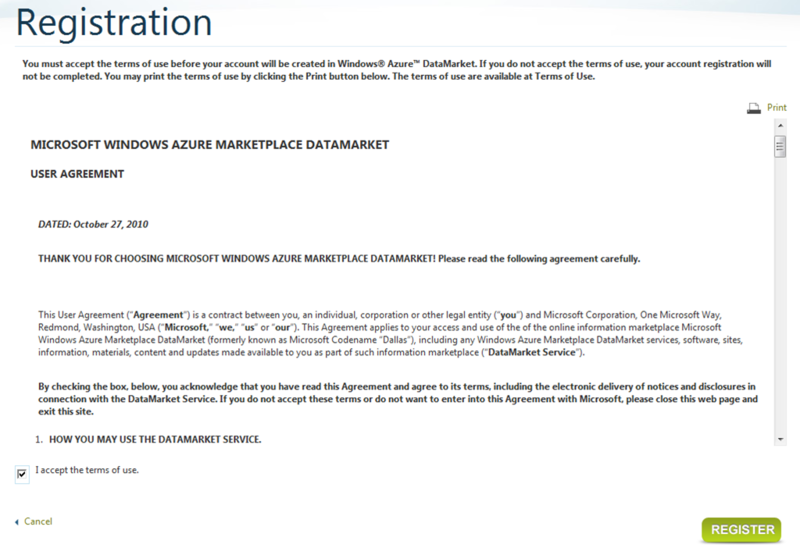 Ok, so now that we have rebooted lets take a look at this new functionality that was added…Azure DataMarket data connection. To the clouds we go! 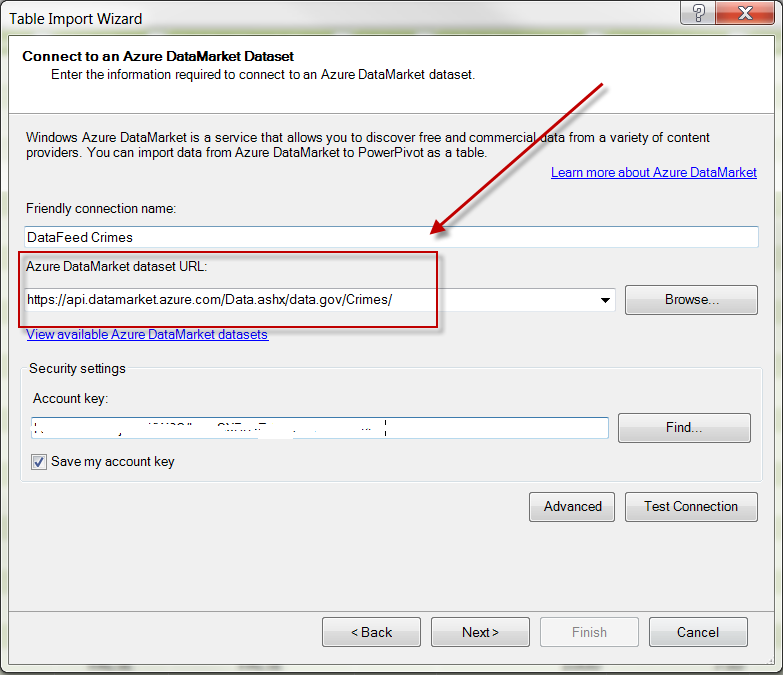 If you go into your account, datasets, you will get the URL for accessing it in the details section of the dataset in the browser. Place this in the wizard Next screen, let’s try the preview now Oh no, didn’t work, what now? Never fear, we have Marco Russo to save us! Just add an extra slash onto the end of the URL string Now we can preview the data. The Test Connection option would work either way, but need extra slash to get data. Let the import begin. Download complete. 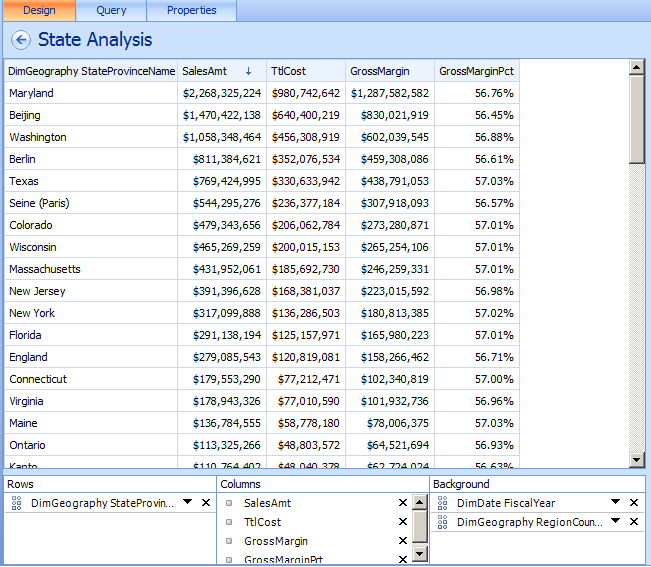 New table in the PowerPivot Windows. 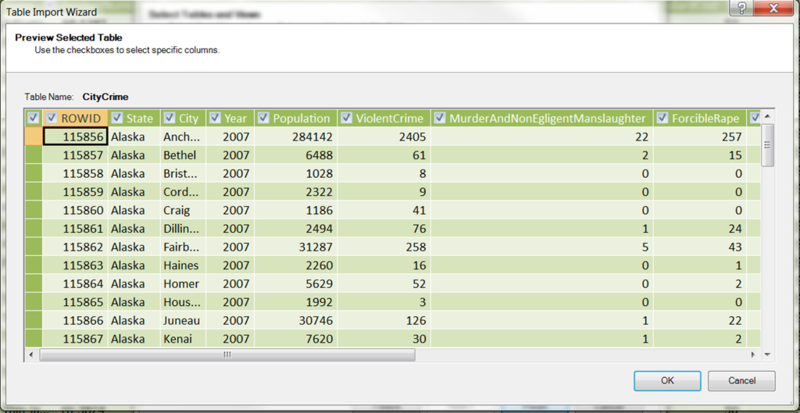 Time to analyze data for violent crimes, MN is looking okay (#34). How cool is this? Really neat that we can tap into some external data and get this incorporated into our existing internal data for analysis. 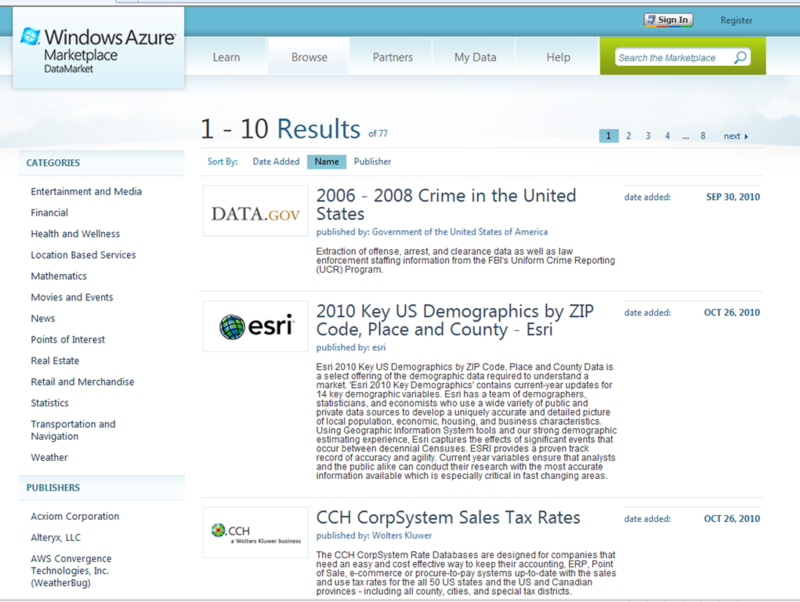 Lots of data is available out on the Azure DataMarket to take a look at including weather information which is always useful. 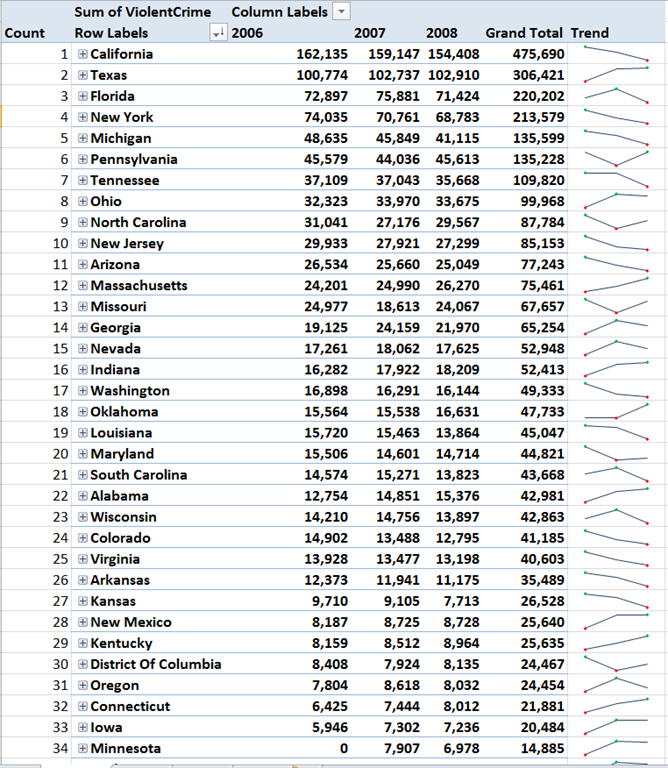 This analysis I did was extremely raw and has tons of gaps since I find it hard to believe MN had zero violent crimes in 2006 and you have to factor in population sizes into this analysis (that information was included, just not part of my Pivot or metrics). 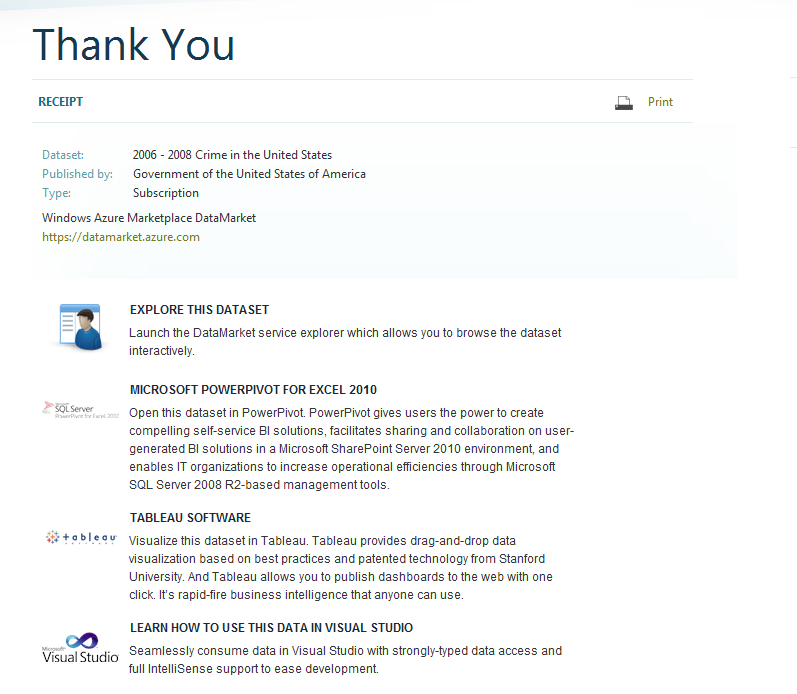 So what are you waiting for, go ahead and download the latest version of PowerPivot and tap into some new data feeds –> Download PowerPivot. 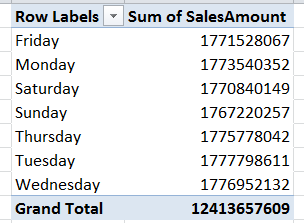 So a couple of weeks back I did the posting Calculating Previous Year Marketing Calendar Values with DAX where I talked about a solution for getting at previous (last) year values in DAX with Marketing (Retail) Calendars. For the most part the solution worked, but as I looked at the results a bit closer I noticed that it eventually broke down and failed. Why is this? 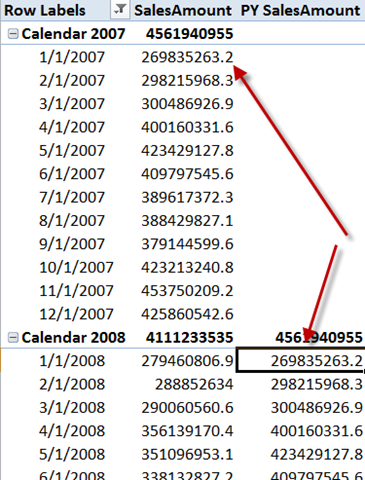 Well the answer should have been obvious and I have ran into this before, but eventually these 445, 454, 544, or 13 period calendars run into a small issue that they need to deal with. The issue is that these calendars only deal with 364 days (13 periods x 4 weeks x 7 days = 364 days). So there is an extra day that we eventually need to deal with and then we run into the leap year and all of this eventually creates the mysterious week 53! Dividing the retail calendar into 52 weeks of seven days each, or 364 days, leaves an extra day each year to be accounted for. As a result every five to six years a week is added to the fiscal calendar. 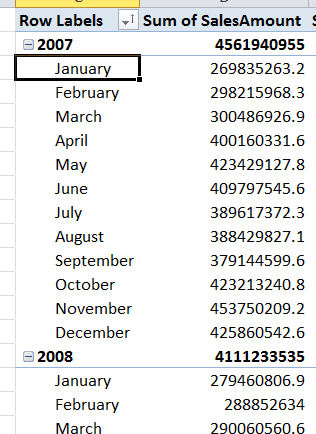 If I go back to my original solution and scroll a little further down in my PivotTable I would have seen this since in Feb 2008 we run into a leap year. This eventually causes the solution to bomb out when we get into the 2009 and 2010 comparisons and so on. So now we are back in business. Just needed to expand out the original solution into each of the different time frames that we wanted to analyze and make sure that we have the previous year mappings setup according to our business rules in the table we are referencing. 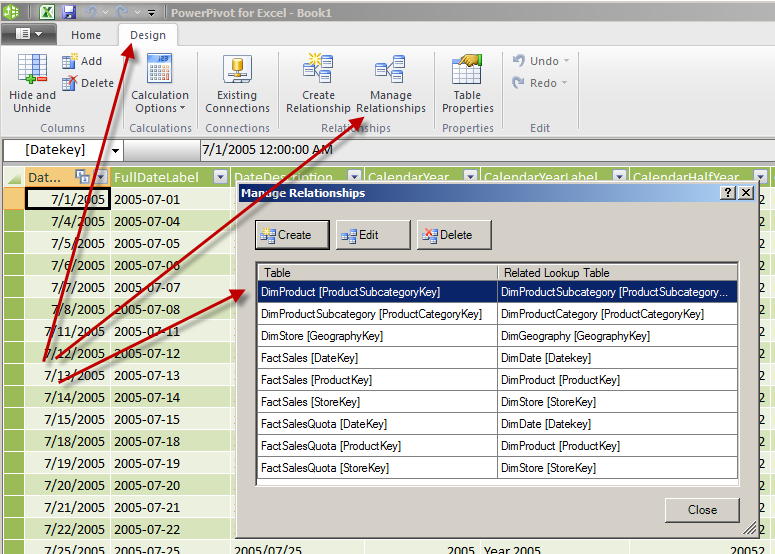 Back in June I did a post called Where did my PowerPivot Excel 2010 tab go? and I talked about being impatient waiting for Excel to startup. 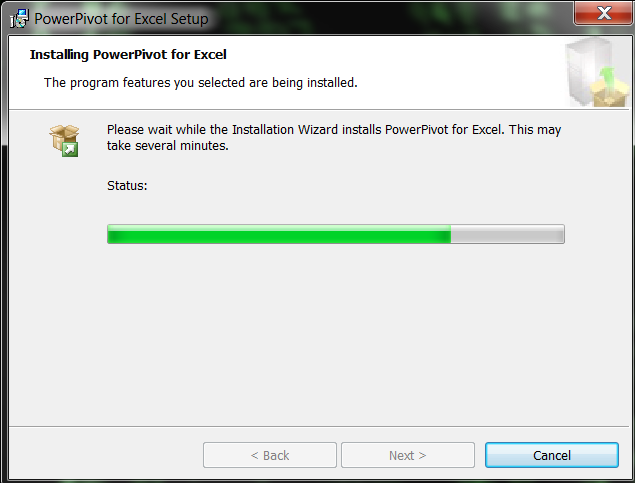 The reason that it takes longer now is that I have to wait for the add-ins to load and specifically the PowerPivot one now that I am using that with Excel 2010.
denglishbi any options to speed up #Excel 2010 loading. 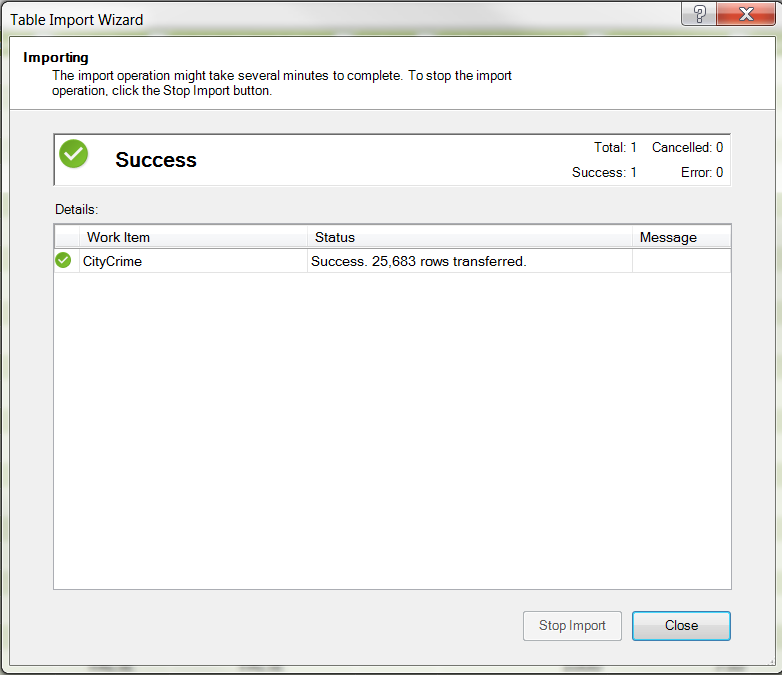 now that #PowerPivot is installed it takes too long to load add-in & extras. please speed up. 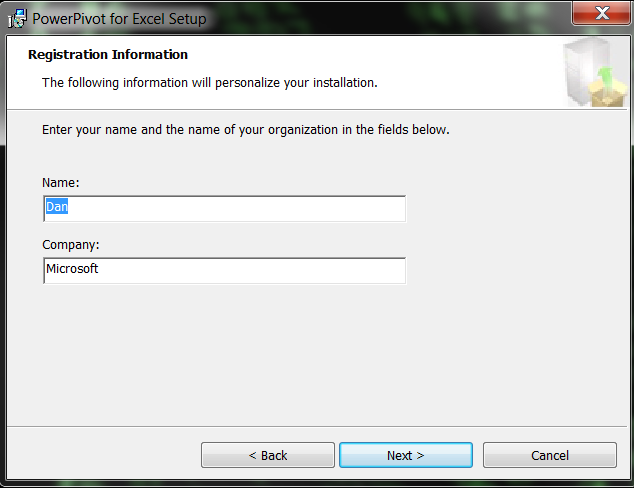 I then did the post that I referenced above talking about how I was able to disable the PowerPivot add-in by clicking on the cancel option on the startup splash screen when Excel loads up. Little did I know there was someone observing my comments and they decided to take some time and actually build out a solution! And his name is Hrvoje Piasevoli (Blog | Twitter). 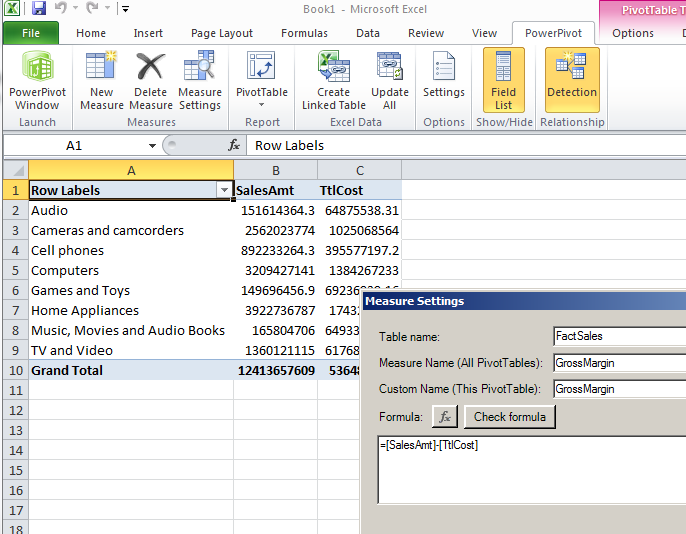 He came up with a solution creating some PowerShell scripts – Shortcuts to start Excel with or without PowerPivot add-in. Today I download the solution and ran the setup process provided in his instructions and it works like a charm! Big kudos to Hrvoje! One thing to watch out though is that if you don’t use the shortcuts to access Excel the next time that it will load up the last option that you ran. 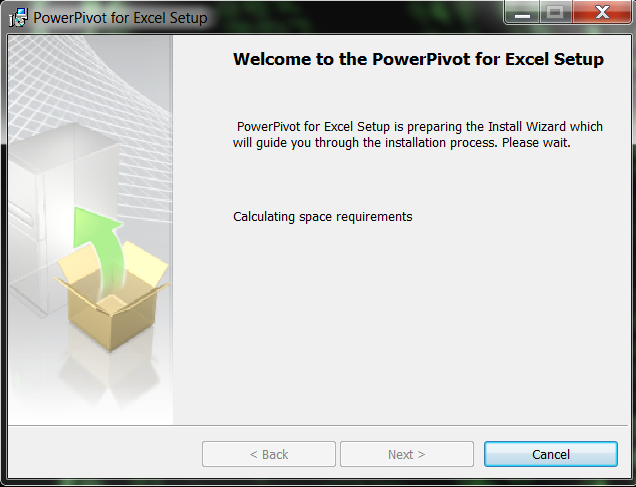 This means that if you do the ‘Excel Only’ shortcut, close Excel, and then click on the Excel shortcut in the start menu that Excel will load normally (without PowerPivot add-in). 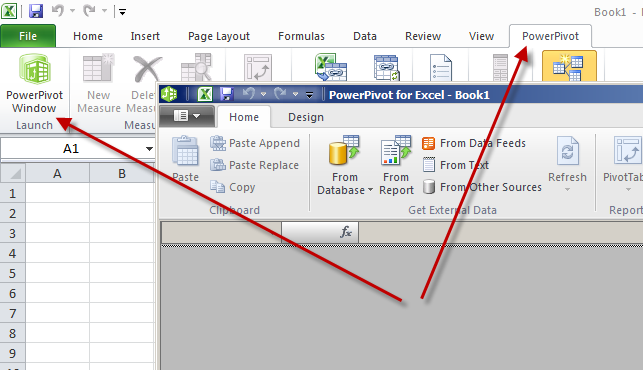 To enable the PowerPivot add-in you can follow my steps in the posting above or simply close Excel and then double-click the ‘Excel with PowerPivot’ shortcut on your desktop. Many thanks go out to Hrvoje for creating this setup. Maybe it should be moved out to CodePlex? Not sure what the process is for that, but definitely a sweet little setup and even includes an uninstall process. Once again, thanks Hrvoje! You rock! UPDATE (9/27/2010): watch out for the mystery 53 week that occurs every 5 years or so. formula does not account for this at all and will fail eventually. 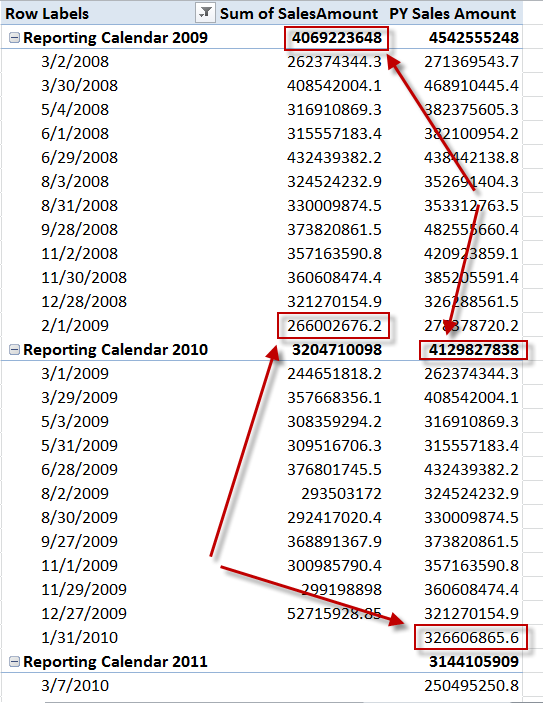 UPDATE (10/9/2010): I have an updated post that has a resolution for handling the 53 week Marketing (Retail) Calendar setup – Round 2: Calculating Previous Year Marketing Calendar Values with DAX. When it comes to reporting typically we will use the common calendar year that starts on January 1 and goes through December 31 with the standard months. We might even be faced with a fiscal calendar that starts on July 1 and ends June 30 the following year. In both of these cases we are sticking with the set days in the months and are not doing anything special. But what happens when we start to use a custom calendar for marketing or retail purposes like a 445, 454, 544, or possibly 13 periods of 4 weeks each? Will this have any impact on how we need to create our metrics to report on our data? The answer – Yes. Because in this case we are not simply evaluating September 1 of this year to September 1 of last year. Nope. We are actually evaluating it to September 2 of last year which is the same day of the week. 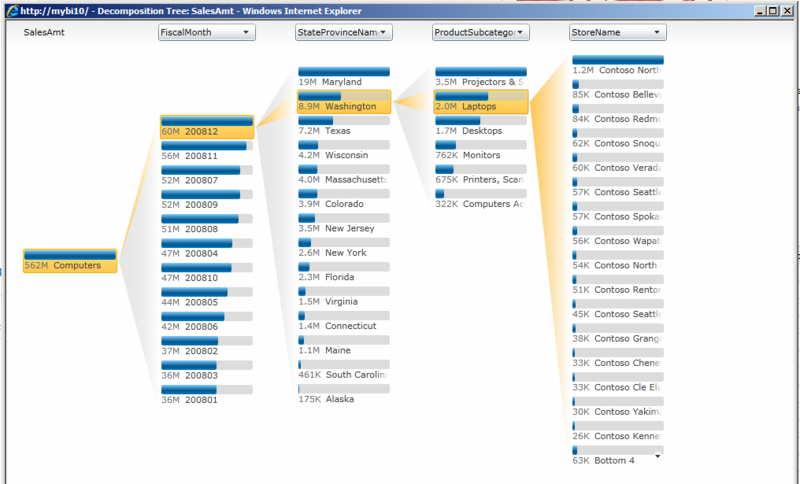 So now the challenge is how can we do this and how can we do it with PowerPivot using DAX? Disclaimer: I cannot guarantee that this calculation and example will work the same as it did for me, so please always verify the results and add any additional checks that may be needed, this is strictly setup as a demonstration. For this demonstration I am going to use a marketing calendar using a 454 week setup that starts with the first week in March. To create this date dimension table I leveraged the functionality in BIDS to create a time table in my data source to generate this table for me – Creating a Time Dimension by Generating a Time Table. This new column is what I call the ‘silver bullet’ that will be required to reference in our DAX formula. I am kind of blowing it by introducing this first, but I will continue on and show a couple of DAX formulas for a typical calendar and then how it will be adjusted to work with the marketing calendar. 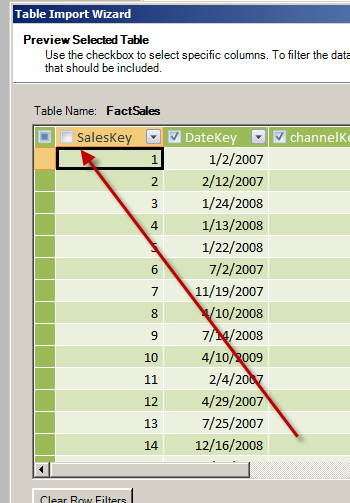 Once we have this table setup and have some facts that we want to relate to this new time (date) dimension we go ahead and load this into PowerPivot and setup our relationship between the two tables. There we go. That is what we want. Now we are looking at equivalent dates. 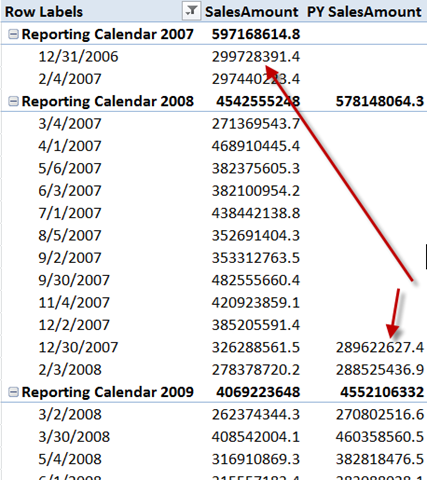 So we need one measure to use with standard calendar reporting periods and a different one if we are reporting against equivalent time periods like using a 454, 445, 544, or some other type like 13 equal 4 week periods. The secret ‘silver bullet’ is the additional previous year equivalent date column in the time (date) dimension table that is utilized to make the results we need. Warning: As stated above I cannot guarantee that this is going to work the same in your environment and you might need to include some additional IF logic to do some additional checks to return BLANK(). Shazaam! Sweet. Now if only you could do this in the Slicers that would be golden, but no such luck. Plus this is only for the particular PivotTable that you performed this on, so you would need to continue to remember to sort the label names in other PivotTables. Hope you like that little trick, I know I do. 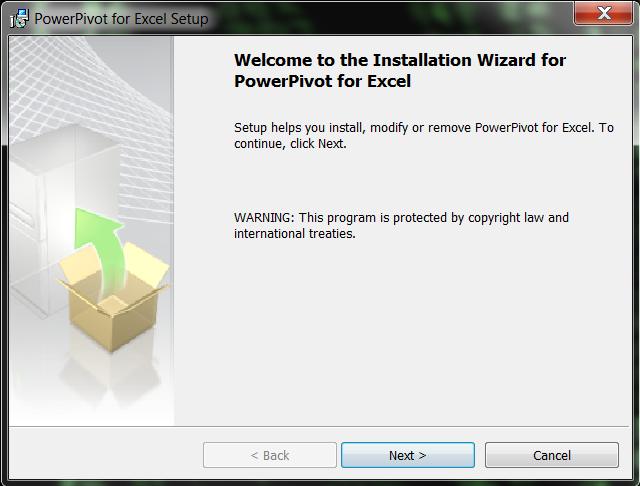 What happened to my PowerPivot Excel Data? 1904? What the? Well now, that is what we want. But we don’t want to use the copy/paste option because we want to streamline the load process and eventually schedule data refreshes in SharePoint. So what is causing this to happen? Well it turns out that different versions of spreadsheet software have different start dates and actually Excel provides a way for users to set the starting year date to not reference 1900 (which it thinks is a leap year, but it actually isn’t) and to use 1904 instead. This was news to me. I tracked down a Microsoft knowledge base article in regards to this issue as well XL: The 1900 Date System vs. the 1904 Date System. 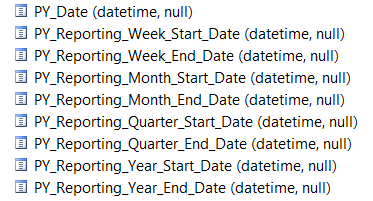 So since the Excel file I was loading the data into did not have the 1904 setting in place, but the source file did then this caused the dates when loaded using the import option to be offset by 4 years and 1 day. What we ended up doing was changing the source file setting to not reference the 1904 starting year and then adjusted the dates accordingly. Once we did that we were back in business. We did contact the business users and verify that this was okay and made sure they were aware of the change we were making. It turned out they didn’t even know about the setting either. Weird. Assuming someone that originally created the file must have done it for some reason. 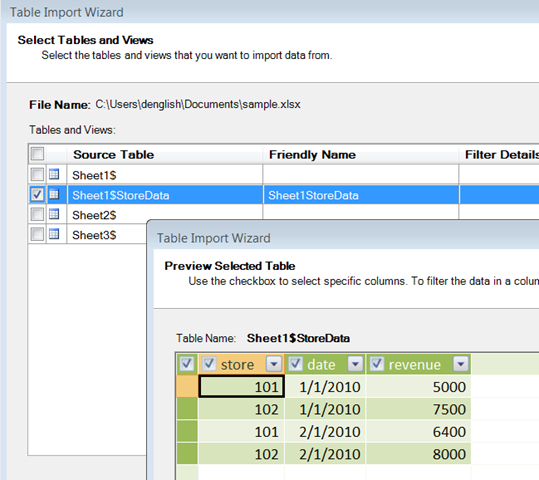 So wouldn’t you know, one of the source files that we get to load into PowerPivot is Excel. 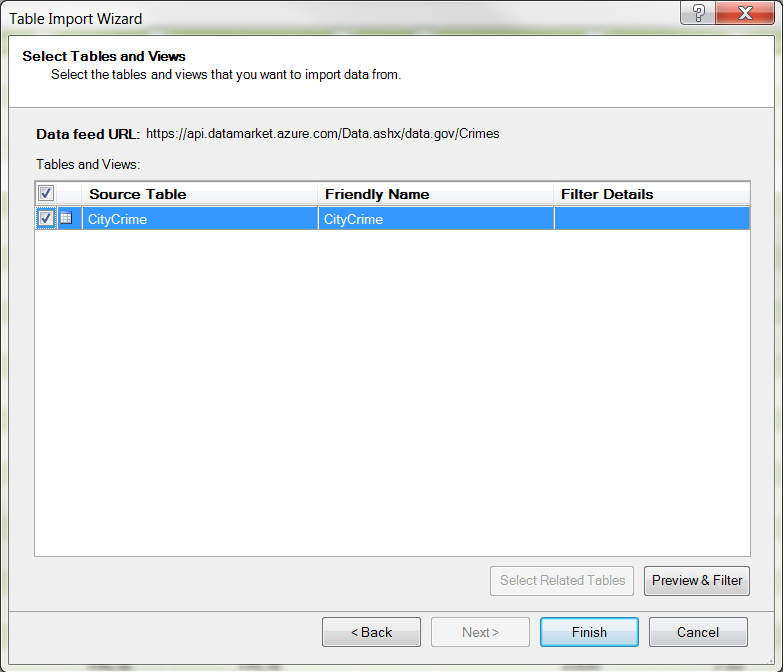 Initially the data was being loaded into the PowerPivot Window using either the Linked table or the Copy & Paste options. I immediately decided to change this option to help streamline the process and decided to use the ‘Excel File’ import option under the ‘From Other Sources’. 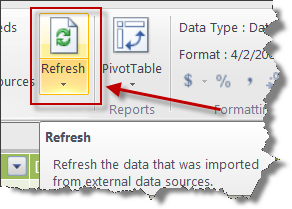 The reason that I did this was to be able to quickly refresh them by using the ‘Refresh’ option in the PowerPivot Window and to also be able to eventually leverage the scheduled data refresh option in SharePoint. The one thing about this setup was that I had to have a fairly clean file to start with, meaning that the data was in a pretty standard format with no special headers or cells in the file, just column headers and data. It didn’t matter if the data was starting out in cell A1 because the import wizard could detect this and would properly grab the data even if it started in B3. What I would run into would be some typical Excel applications that had some crazy layouts with tons of worksheets and formulas all over the place. These files typically had some data in the top left-hand corner that was helping to drive the entire worksheet. Now for these worksheets I had to go ahead and setup a named range in the Excel worksheet. 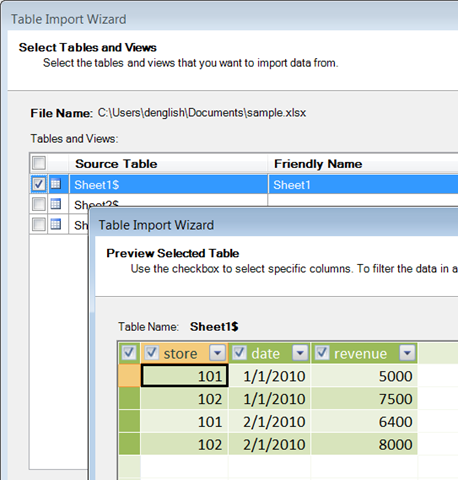 Once this was setup we could then reference this named range when importing the Excel data into PowerPivot. Now in my example here I wouldn’t have had to have done this, but this is just showing you how you go about doing this type of setup. 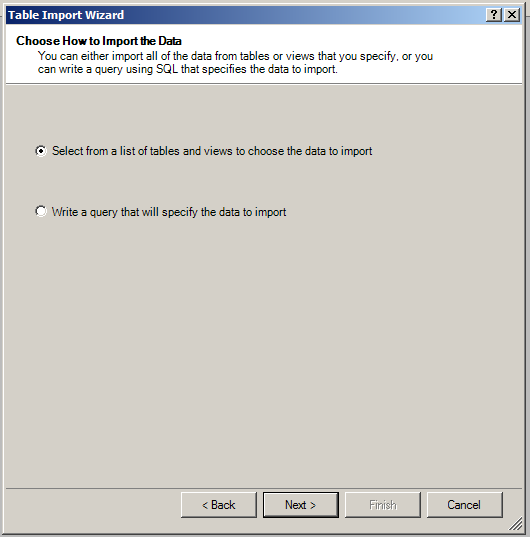 You will just need to make sure that if the data in the source file changes that the named range gets updated appropriately so that you can refresh the PowerPivot data without any issues. The other thing that we ended up doing was making sure that the source data was being stored in a common location, which means not on our workstations. The location we picked was a SharePoint document library. We then accessed the data utilizing the SharePoint WebDAV protocol meaning we were using UNC paths out to the SharePoint library like such – \\ServerName\DavWWWRoot\Site\DocumentLibrary\ExcelData.xlsx. 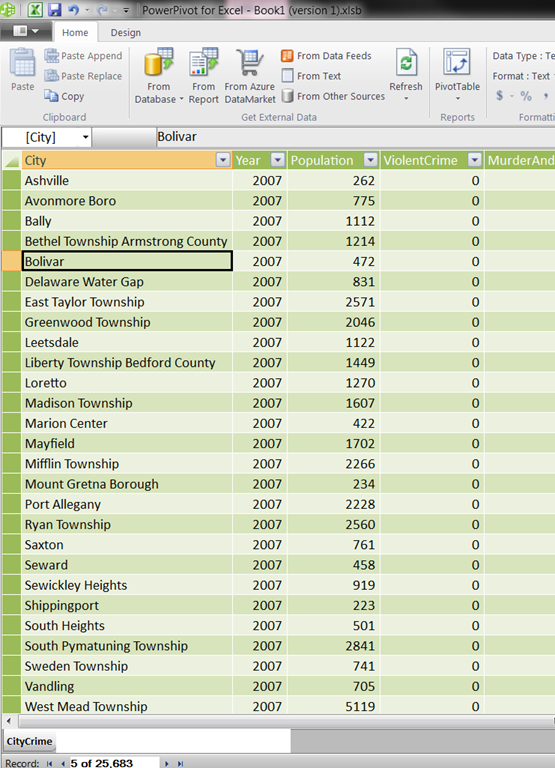 Now that you have all of the data loaded into PowerPivot referencing a shared location the next step would be to create some PowerPivot PivotCharts and PivotTables (if you are using PowerPivot reporting functionality). 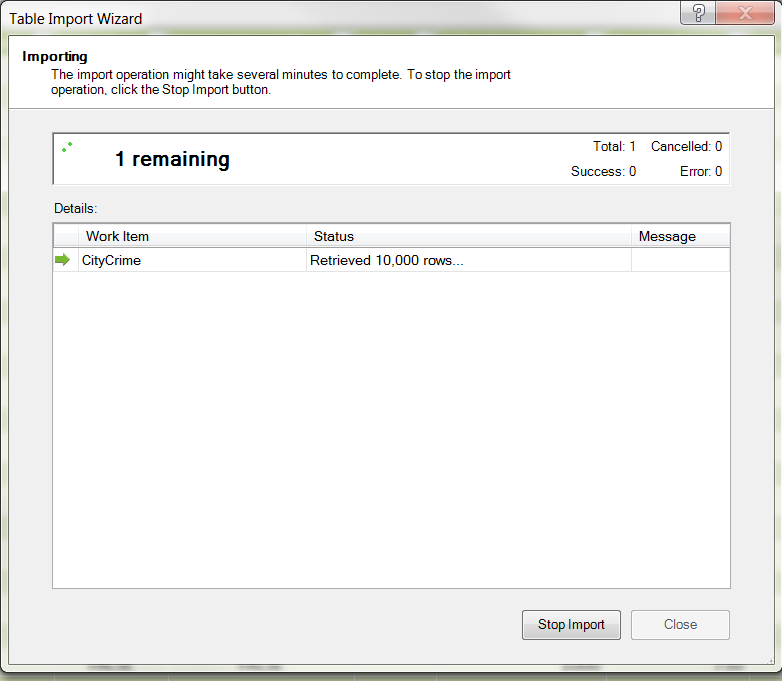 Once this is done you will want to then upload the data to SharePoint into a PowerPivot Gallery to share with the end-users. 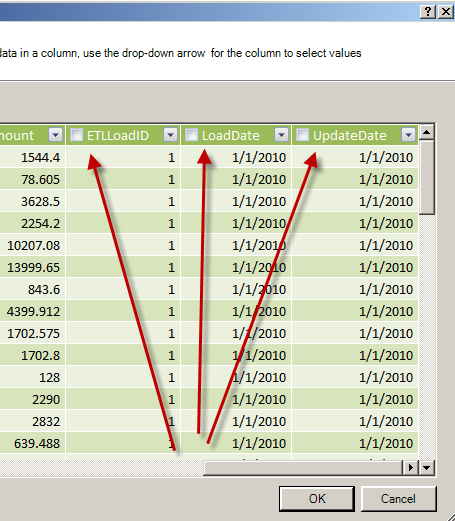 The PowerPivot Gallery is also where you get the option to schedule data refreshes and this is what we are after. 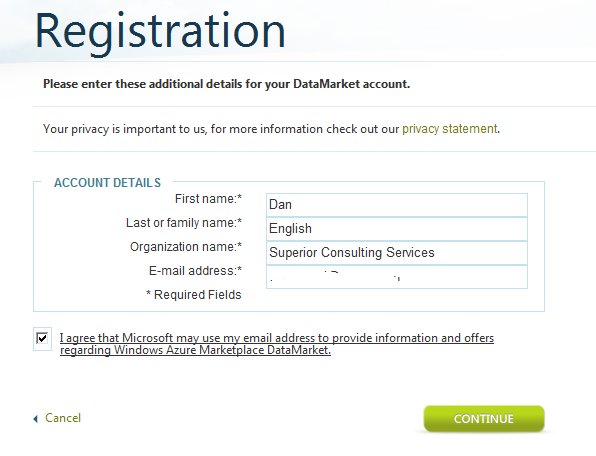 The provider ‘Microsoft.ACE.OLEDB.12.0’ is not registered. 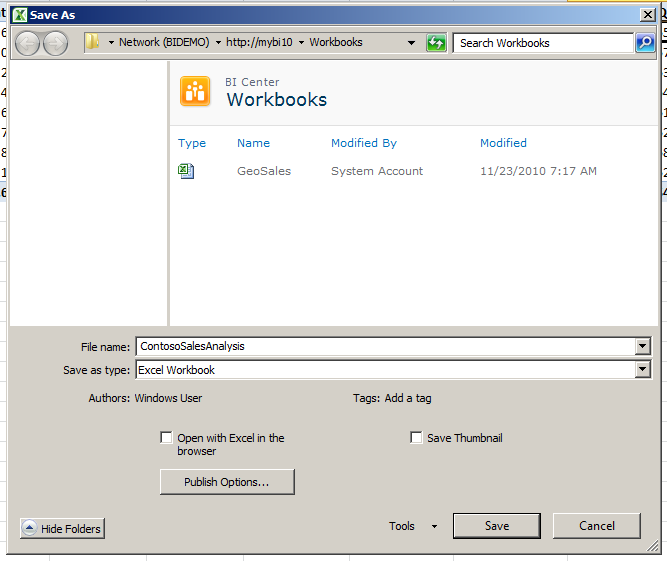 The following system error occurred: Class not registered A connection could not be made to the data source with the DataSourceID of ‘<guid>’, Name of ‘<PowerPivot ConnectionName>’. 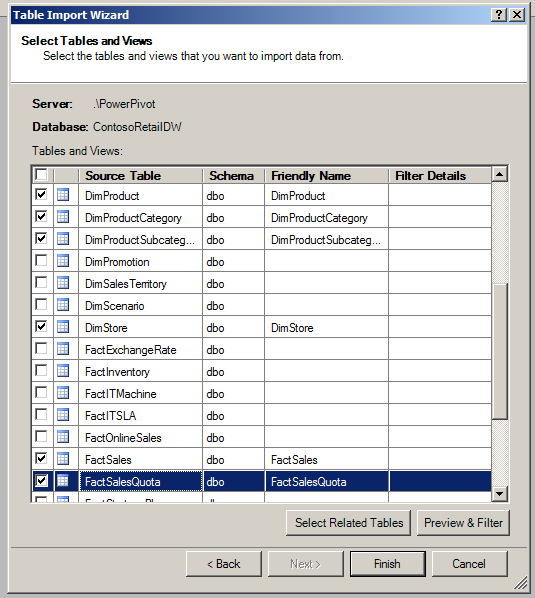 An error occurred while processing the ‘<PowerPivot TableName>’ table. The operation has been cancelled. 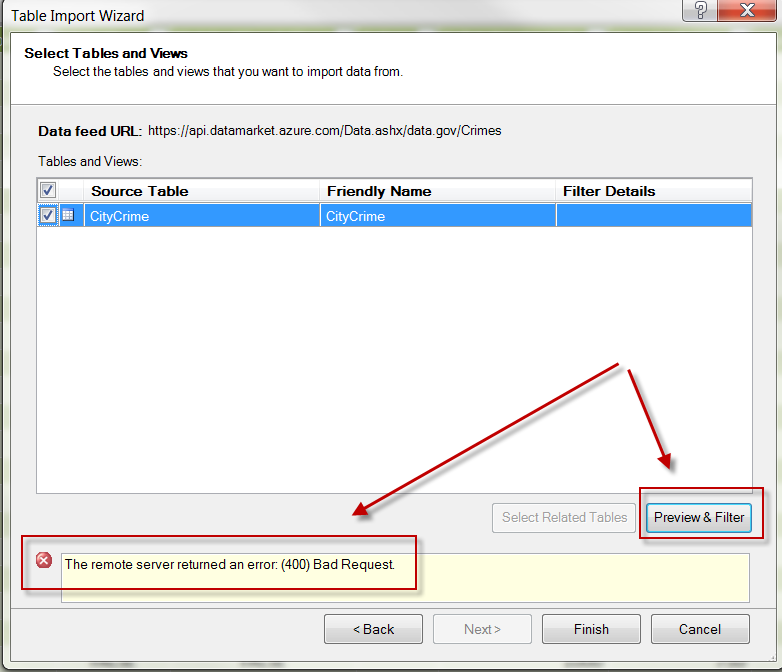 OLE DB or ODBC error: Failure creating file. ; 3436. 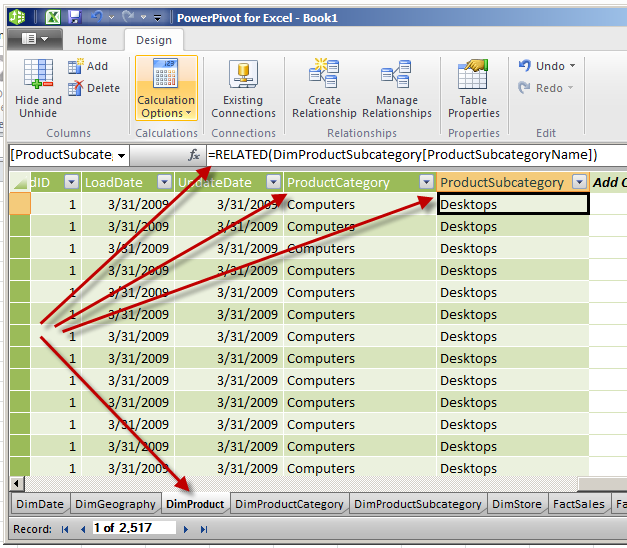 A connection could not be made to the data source with the DataSourceID of ‘<guid>’, Name of ‘<PowerPivot ConnectionName>’. 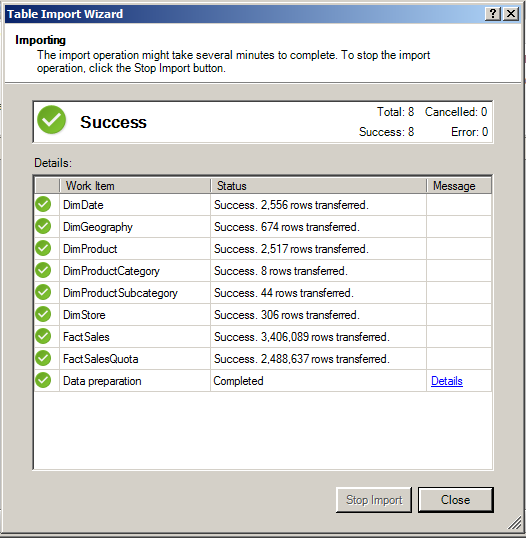 An error occurred while processing the ‘<PowerPivot TableName>’ table. The operation has been cancelled. After some quick research I ended up on Dave Wickert’s site (if only my initial search would have brought me here first, or if I just recalled reading this posting earlier this year…) Working with the 2010 Office ACE provider. This told me that I needed the Desktop Experience feature enabled on the server. Unfortunately this was already enabled since this server was setup in a Sandbox setup for development purposes. After a little more testing, reloading the PowerPivot file in the Gallery, and running the data refresh again I ended up with a successful data refresh. 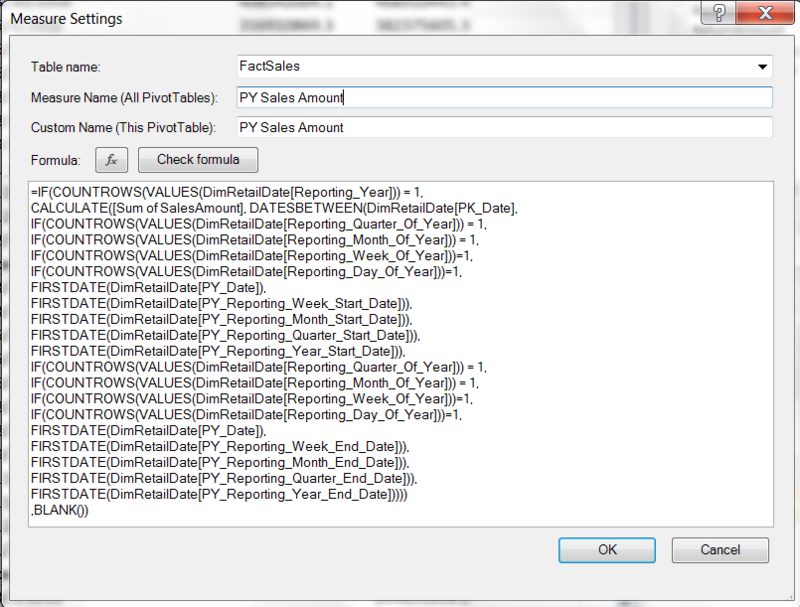 Ahhh…..relief….satisfaction….scheduled Excel data refreshes into PowerPivot:) Excel-to-Excel, sweet harmony. The other part that I really like about this product was the additional insights that were provided by the product team members talking about how the product came to life and the different paths that were explored initially (originally MS Access was looked at…phew). The exercises that were provided were helpful and the troubleshooting section was very useful, especially coming from the IT side of the world. All-in-all I would highly recommend this book to the IT Pro and would give this book 5 out of 5 stars – . Definitely worth the $$$. Next on the list came the book from Mr. Excel (Bill Jelen). I have to admit that I had not heard of him until the great Alpha Geek Challenge came about that Microsoft launched promoting the PowerPivot product. I tried to get involved in Round 2, but ended up in Round 3 going head-to-head with Mr. Excel. This book is definitely geared towards the Excel user and that was expected. I have not read any of Mr. Excel’s books, so I wasn’t used to his style of writing. There are some comments made in the book about ‘blowing a gasket’, ‘insane things that come out of Redmond’, ‘going hack off the people in Europe’ (not sure what that even means), etc. that I did not find appropriate in a formal published book. These comments would have been better suited for a blog posting possibly, but not for a book that I might want to recommend or keep on my bookshelf. The book does a good job explaining the differences between Excel and PowerPivot, going over all of the functions available to you, providing some examples to go through, and providing advice for publishing workbooks (formatting and look-and-feel). At the very end it talks briefly about the SharePoint side of the world, but at a very high level. I did get a good laugh when it stated ‘Build a PowerPoint pivot table’ (easy mistake and the names of products now are really easy to mix up). If you are an Excel user and are looking to make the switch to PowerPivot then this would be a good reference book. The price is right and I would have to give this book 3 out of 5 stars – .